When you stay at Ciloms Airport Lodge in Melbourne Airport, you'll be near the airport and 11 minutes by car from DFO Essendon. 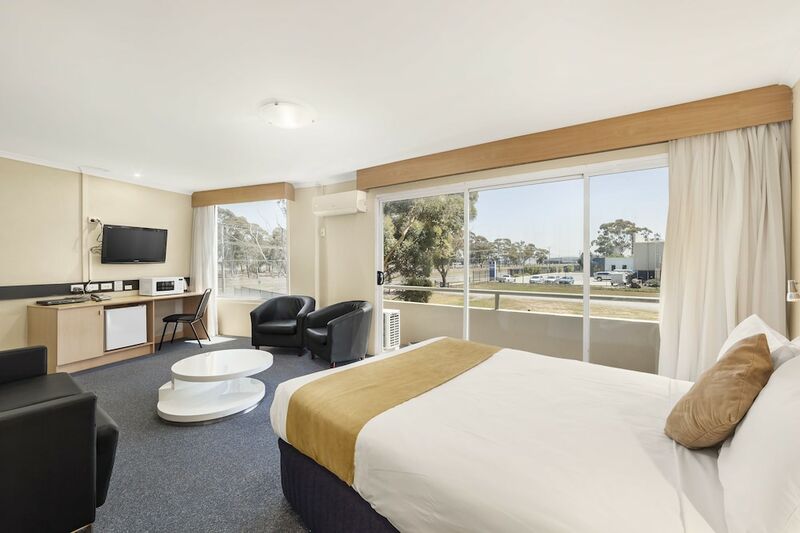 This motel is 9 mi (14.4 km) from Flemington Racecourse and 11.1 mi (17.9 km) from University of Melbourne. Make yourself at home in one of the 95 air-conditioned rooms featuring refrigerators and microwaves. Flat-screen televisions with cable programming provide entertainment, while complimentary wireless Internet access keeps you connected. Private bathrooms with separate bathtubs and showers feature complimentary toiletries and hair dryers. Conveniences include phones, as well as desks and complimentary newspapers. Take advantage of recreational opportunities offered, including an indoor pool, a spa tub, and a sauna. Additional amenities at this motel include complimentary wireless Internet access and a television in a common area. Getting to nearby attractions is a breeze with the complimentary area shuttle that operates within 5 km. Grab a bite to eat at the motel's restaurant, which features a bar, or stay in and take advantage of the room service (during limited hours). Buffet breakfasts are available daily for a fee.